Last year I participated in the NaNoWriMo (National Novel Writing Month) festivities and had a most EXCELLENT experience. 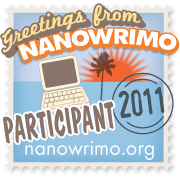 Well, November is right around the corner; I’ve started getting emails from local moderators and have been notified that the website has been updated for NaNoWriMo 2010. So now the question is…will I try it again this year? Like I said, I had a great time last year. I “won”…making my word count of over 50,000 words in 30 days. I even traveled cross-country in the midst of it and pulled it off. Now, I made the word count but, technically, my story is not finished. In fact, it has languished for the past year without me even looking at it. So, essentially, it was fun while it lasted but I haven’t looked back. Since then I’ve been focusing on getting a short story published…which, while my output has increased over the past year compared to the year before, and I even placed in a contest with one of my stories, I’ve had no joy on the publishing front. Lately, all my output has been slowed–including my blogging. My serial stories for this site have been emerging slower than a stunted moth tunneling through a cocoon filled with molasses. So I wonder–should I skip NaNo this year and focus on my “real” writing or take the plunge once again, slowing my already glacial output rate even further for the next 30 days? Chances are pretty good I’m going to try it. I’d like to come up with an idea that I can actually finish this time instead of just making the word count. I have written more in the past year than I did in the year preceding last year’s event. I’ve learned so much more about writing well since the last time around. And, even if the part of me that wants to be a big-shot-published-author says “it’s a waste of time”, I feel like I need to embrace the idea that all writing is “real” writing, whether for fun, profit, or just practice. This entry was posted in Ramblings and tagged motivation, nanowrimo, writing. Bookmark the permalink. I think you should write a Lars short story (did you see it coming?) Something post Empire, after our return…some adventure in his later years…the old, retired adventurer slaps on his spike fist to answer the call of faerie troubled farmers whom no others will listen to. Lars must leave his sword school and larslings behind to make a day-trip with Donovan in tow as back up to find and slay the troublesome faerie harassing the simple dirt farmers who can not afford the help of their so called “lord”, but who stroke the ego of the greatest faerie slayer of all, after all, I NEARLY killed 2 Helmecaloni single handedly, literally single handed. I failed miserably w/ the word count and have had pretty much no inspiration to write since, but I’ll bee participating once more!